Jones product innovation takes one more step on our journey along the “green path” with the new and improved AM™ anti-microbial yarns. The antimicrobial protection for the 096004 and 506504 series yarns is based on the natural antibacterial properties of silver. Jones AM™ yarns are spun with fibers infused with silver nanoparticles. These extremely small particles are introduced into the polyester fiber during the extrusion process. The treatment is not topical so the protection lasts for the life of the yarn; it will not wear or wash off. Silver ions are non-leaching, environmentally-friendly, non-toxic, non-allergenic and are completely safe for human contact. AM™ yarns are ideal for wet and dry mopping applications in food service, healthcare and commercial facilities with limited laundering capabilities. Bacteria, molds and mildew contribute to “mop-rot.” By its very nature, when a mop cleans a floor, it picks up organic matter, soil, food particles, mold, mildew and even bacteria-laden particulate. AM™ yarns resist the growth of destructive microbes that cause mop odor, yarn discoloration, yarn staining and fiber breakdown. Despite numerous developments in floor care products, cotton remains king. Cotton yarns are designated for the dirtiest and lowest budget jobs. Cotton’s superior absorption and “wipe-dry” properties combine with the economy of natural fibers to engineer a product that is ideally suited to work equally as well in household deck mops or industrial looped-end products. The blend is a combination of cotton and recycled textile fibers. Recycling for mop yarns is not a new technology; in fact, Jones has produced yarns from recycled textile mill fiber for over 80 years. RF™-Yarns [recycled fiber yarns] are the core of Jones’ eco-products. The recycled fiber includes blends of cotton, rayon, polyester and shoddies produced from nonwovens and conventional textile structure remnants. Our “eco-initiative” strategy targets fiber source identification, which broadens available blends, increases raw material supply, reduces cost and improves product performance. Jones was the first yarn supplier to offer the floor care market a range of cotton blend yarns specifically engineered to maximize performance and extended durability. These products provide unique fiber combinations produced by two spinning technologies. Rotor spinning and friction spinning manufacture diverse yarns with exceptional features to meet a variety of graded performance standards and economic targets. This product group has recently expanded to include yarns that offer similar performance at a more economical value. In 2009, Jones once again led the industry by introducing recycled PET to shade all of our yarns with color. The enviro-color™ yarns are spun with a blend of recycled post consumer PET and recycled post-industrial fibers. Although normally thought to be a synthetic fiber, rayon is actually a natural fiber derivative of wood pulp. Rayon-like cotton is a cellulose fiber, meaning that its cell structure is hollow. The hollow cell structure is the reason for the absorbent properties of this fiber. The processing of the wood pulp purifies the fiber and removes natural protective oils, allowing the cells to quickly absorb liquid without the break-in requirement associated with cotton fibers. The absorbent properties make rayon blend yarns ideal for wet mopping; however, they reach saturation levels quickly and therefore do not offer the same wipe dry performance like cotton blends. Rayon blend yarns are bright and clean because they do not contain plant residue visible in cotton blend yarns. Although rayon blend yarns launder well, special attention should be given to water and drying temperature, as excessive temperatures can result in yarn shrinkage and reduce product life. The 700004 series yarn is available in white, blue, green and orange. The shading of these yarns is achieved by blending in colorfast solution dyed recycled PET. The yarns are branded as enviro-color™ yarns. nWET is an innovative alternative material that meets or exceeds the performance requirements of conventional economy spun yarns. The absorption exceeds 600%, which is more that 150 to 200 points better than conventional spun rayon blend yarn. The bulk of the nWET strips also allows you to manufacture an equivalent mop using approximately 50% of the weight required in the conventional string mop. These two factors alone position nWET as a viable alternative raw material. nWET is available in white premium gauge fabric weights. The material is a blend of rayon and polyester with a soft texture similar to the nonwoven fabric found in baby-wipes. The material is available in single end, 10 or 24 multiple end packages. nWET is ideal for limited-use or disposable applications. Jones offers a complete line of 100% polyester tailband and headband tapes. Our tapes are flat knitted constructions that offer superior stitch holding performance. The tapes are available in white, blue, green, orange and red colors. Our line includes 1/2 inch, 5/8 inch, 3/4 inch, 1.0 inch, 11/4 inch and 11/2 inch widths. We maintain a significant inventory ready to ship with your yarn needs. Combining these tapes with your Jones Yarn orders eliminates the high delivery costs associated with buying them alone. We understand that the quality of a mop is directly related to the quality of every raw material component used in its construction. For this reason, we apply the same approach to quality assurance in our accessory products as we do our yarn. Our headband mesh products include the industry standard woven polyester and the premium vinyl coated styles. Both products provide superior durability and value-adding properties for your mops. The meshes are available in pre-slit 5.0 inch and 11/4 inch widths. We inventory the polyester and the vinyl coated styles in blue, green, yellow, orange and red colors. Jones is committed to servicing the needs of the floor care market. Our 100% polyester Air Entangled sewing thread is specifically designed for the stringent requirements used in seaming for the bedding industry. These superior features easily translate to the durability demands for sewn mops. The thread is available in Tex 60 and Tex 90 sizes. The large KingSpool packages help to lower your production cost by reducing thread changeovers. Our thread provides excellent stitch strength, and the low profile minimizes exposure to surface abrasion. We stock the thread in white only. Colors are available by special order. NEXT GENERATION is more than just a line of new products; it represents Jones’ rejuvenated commitment to the cleaning industry. Our strategy for the future includes a multi-faceted approach targeting innovative, value-added and performance tested products. We’re not just thinking outside of the box, we’ve thrown it away. In addition to out-sourced products, we will continue to stretchthe boundaries for raw material fiber sources and continually challenge our spinning expertise to develop new yarn products. Our primary field of vision will be on the future while meeting the needs of the current ever-changing marketplace. The global market requires that products be competitive; however, while economy is relevant, we will not diminish our focus on quality. The floor-care market is in a state of change that demands innovative approaches to insure the successful adaptation to evolving business models. Our strategy involves developing key alliances that target opportunities with deliberate and measured approaches. We welcome the task of identifying obstacles and working with partners to forge new ground in the cleaning industry. NEXT GENERATION is a vision for planting seeds for the future focused on a mutually beneficial relationship with our customers and suppliers. Jones CARPET CARE BONNETS are designed to meet industry standards for superior soil absorption, performance and extended use durability. The line includes traditional bonnets of blended yarns and nylon with scrubber strips. 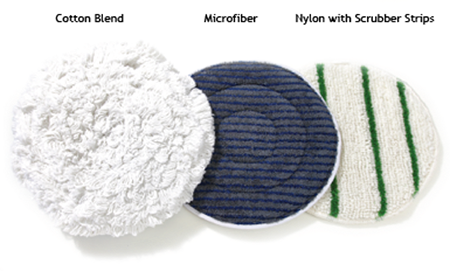 In addition, we are introducing the microfiber with scrubber strips bonnet. 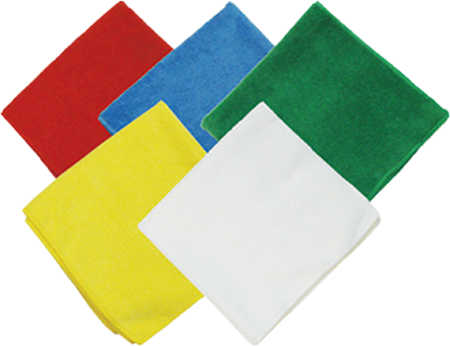 MICROFIBER HAND CLEANING TOWELS complete any cleaning regimen. The generously sized 16-inch square towels provide ample hand cleaning surface. The cloth is a premium combination of synthetic polyamide fibers in a knit loop construction. The synthetic fibers develop electrostatic properties, which enhance dry dusting applications. Using microfiber for cleaning requires less cleaning solution, which is better for the environment. MICROFIBER TUBE MOPS bring the cleaning advantages of thousands of tiny filaments to a conventional spun yarn style mop. Premium headband and tail-band components insure durability equitable to the tube strands. 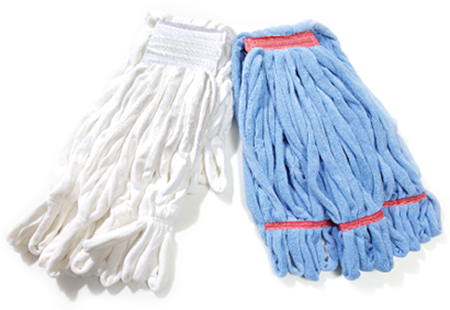 Microfiber flat mops are limited to light duty and minimum debris volume applications. The innovative microfiber tube strands trap larger contaminants and can be wrung-out in a standard rinsing bucket/wringer.